When I was a kid, back before dinosaurs strolled the earth, goin’ tubin’ meant finding an old, used inner tube. Since cars, trucks and tractors still used inner tubes, finding one was easy! Keeping an inner tube from summer-to-summer wasn’t so easy. I never seemed to remember that an inflated inner tube left in the hot sun deteriorated quickly. I didn’t worry about cracks in my recreational tube, after all – inner tubes were cheap and they were everywhere! Finding any large inner tube today for river tubing isn’t so easy. Generally, most folks have started buying “towables” — clever float-ables that can move one or more people at the same time. However, this post is about keeping and repairing a large inner tube. Yep, duct tape will make quick, temporary repairs. However, duct tape must be applied to a dry tube. Scuff up the area around the tear — with the lid of the repair kit. Apply cement to the area to be patched (cement is included in kit). Turn the repair can on its side and roll repeatedly over the patch. Let things rest for a few minutes. Roughing up the area around the tear is necessary for a firm seal. Use the tip of the container to smooth the cement around the hole or tear. For large tears, make sure you cut and round the edges of the patches. If you don’t, the patch may peel off while brushing against rough stuff. Instructions on the can will indicate how long the patch should “rest” before use. I still remember how much a “cold patch kit” cost (when I was a kid) — 29 cents! The Joy of River Tubing! The goal of river tubing, as practiced by most Americans, is to hop on a tube and float down a meandering river, enjoying the scenery. Unfortunately, some consider this too tame a pursuit — and search for whitewater adventures. River tubing and whitewater don’t mix well. Tubers watch groups of folks in canoes and kayaks having fun in rivers and think they can too. There are a couple of problems with this idea. First, the folks in canoes and kayaks work the river together. They watch out for each other and assist, as needed. Tubers, in contrast, cannot usually come to another person’s assistance because they have absolutely no control over their tube! If they have a paddle, it usually only causes the tube to spin around. Often the tube tips over. The body of the watercraft protects the adventurers inside. You only have to see the mangled body of a tuber that has been separated from his tube or raft — to understand the difference. When a river tubist is thrown from his tube, there is nothing between his body and the hard rocks that he’s likely to “meet” on the way down the rapids — or over a waterfall! Finding a person alive after such a beating in whitewater is the exception, not the rule! Verne Huser, author of River Running (Henry Regnery Co., Chicago, 1977), urges all tubers to use a personal flotation device in any waters. Another protection can be a wet suit. 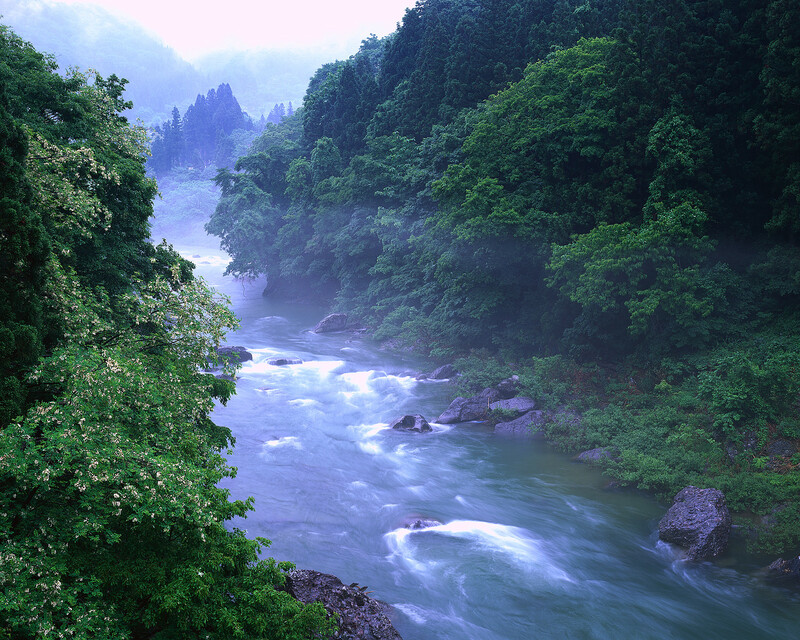 Many rivers have deep pools or are fed by springs. The water temperature can range between 45 and 50 degrees. The body loses heat so rapidly that hypothermia takes over and a person can die. Cold rivers call for a wet suit for each tuber! 32 degr. under 5 mins. under 5 mins. 15-45 mins. This graph was adapted from p. 13, Tubing, by Whit Perry (Greatlakes Living Press, Matteson, Il., 1977). Can there be anything more fun than floating down a river in a tube? I don’t think so …..
One of Summer's Great Joys: Riding Down a River on a Tube! & preparation. Here are a few safety tips to help get you on the water in record time! An ideal tubing locale is a shallow, warm body of water with no obstructions. The idea is for the water to be moving quickly enough to offer a “moving experience,” but slow enough to keep the tuber safe. That combination is a difficult one to achieve. First, a tuber has no control over the tube. Using a paddle usually only causes the tube to spin around. Second, most rivers have parts that are not navigable. It is important for tubers to know where those places are. Contact the state’s “fish & game” office for a map. A pair of tennis shoes – to protect feet from sharp rocks, etc. Tubing items: a knife, duct tape (temporary tube repairs), patch kit, a small air pump, a valve core remover, extra valve cores and stem caps. Personal items: set of dry clothes, waterproof matches, a first-aid/snake-bite kit, food and drinks, extra water (Don’t plan on drinking river water; most waterways have some pollution), personal flotation device (also known as a “Mae West”) and insect repellent. Possibles: If the water is below 60 degrees, you may want to have a diver’s wet suit ready to protect you from hypothermia (a potentially lethal condition, when the cold water chills the body below a tolerable temperature). If you see every snake in the US as a potential killer, you’d best confine your tubing adventures to a swimming pool! Go around snakes, avoiding them where possible. Cottonmouth Water Moccasin Snake — This is the only poisonous American water snake; usually found in southeast parts of the US. Cottonmouth - olive, black, brown skin with fangs he's eager to show off! Most snakes are as afraid of you as you are of them. Not so with the cottonmouth! He usually stands his ground and even likes to show the white lining of his mouth — just so you know who should run first! Being bitten by a cottonmouth is going to ruin your day, believe me. You can avoid this meanie by staying in the middle of rivers and by avoiding banks with shallow water. Diamond-backed with an Evil Eye! Rattlesnakes — These snakes are available from Canada to Mexico. They provide more trips to the hospital and unplanned deaths than any other American snake! Fortunately, they give an intruder advanced warning of their strike — with the rattling sound. The Eastern Diamondback has more venom in a single bite than any other snake. Caution! Copperheads have no sense of humor! Copperheads – This snakes venom is potentially lethal. Need I say more? Oddly enough, he is copper colored! Coral Snake – Absolutely lethal! Remember the rhyme, “Red and yellow kill a fellow …..” Watch for the banded yellow, black and red snake. Others, with similar bands (but not in this order) are non-lethal. The good news is that this snake is not looking to cause trouble. Get the victim to a hospital ASAP. * I used to think that non-poisonous snakes did not bite and poisonous snakes would. That is incorrect; any snake can — and will — bite, if provoked. The venom in non-poisonous snakes just won’t kill you! All snake photos are courtesy of Wikipedia!